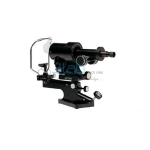 Jainco is a leading Medical Keratometer Manufacturer, Medical Keratometer Suppliers, Medical Keratometer India, Medical Keratometer Exporter, Medical Keratometer, Hospital Equipment India, Keratometer. Jainco are engaged in manufacturing, supplying and exporting premium quality Medical Keratometer. This meter is factory made with the help of refined techniques underneath the superintendence of our diligent professionals victimisation pristine quality elements. For measurement curves of membrane of eyes, the provided meter is extremely applauded in medical business. Engraved focusing scale. Coincidence focusing system.